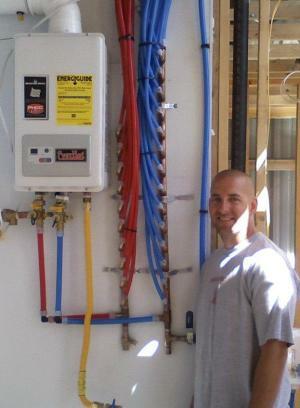 PEX Piping | Keating Pipeworks Inc.
PEX is an acronym for cross-linked polyethylene. The “PE” refers to the Polyethylene and the “X” refers to the cross-linking of the polyethylene across its molecular chains. The molecular chains are cross-linked into a three-dimensional network that makes PEX a remarkably durable plastic polymer. Aquapex is the leading brand of potable water (Hot/Cold) PEX Tubing, manufactured by Uponor WIRSBO. The WIRSBO Aquapex is top quality PEX pipe used for Plumbing applications. Keating has plumbers certified in Gastite CSST gas lines and WIRSBO PEX piping. As a certified WIRSBO PEX installer, your pipe manufacturer’s warranty is extended to 30 years. Call Keating Pipeworks at 720.974.0023 for your PEX plumbing needs.